One of the boys of Sunlight participated in a television program in Saigon, My new bedroom. He was selected as a winner because of his Kung Fu skills, a popular sport for the boys. The prize is a renewal of your bedroom by the production company. When they found out our guy lives with 25 others in a house they decided to re-decorate the whole bedroom at Sunlight. The boys chose a soccer theme. The walls and ceiling were painted and the boys received new bunk beds. Great fun! the Consular Club of Ho Chi Minh City is a social, non-profit organisation comprised of persons from countries represented by a Consular mission in HCMC. The Consular Club has decided to make a donation with which to buy building materials, which will be used to renew the sewage system underneath Sunlight House. The Julia Kids Foundation will pay for the labor. Due to changing weather patterns the house is susceptible to flooding during the rainy season. The renewed sewage system will reduce flooding, odours and provide a real improvement to the living conditions of the boys. The foundation is very thankful to the Consular Club for their contribution. The Cambridge Boat Club (Boston USA) has been visiting Amsterdam for 21 years running to participate in the annual Nereus Rowing Regatta. This year the delegation consisted of 4 men’s eights and 3 women’s fours. They pooled their efforts and made a considerable donation to the Julia Kids Foundation. To the CBC rowers: thank you! On behalf of all our kids, thank you! A group of sponsors visited Sunlight and Thien Phuoc House january 2017. The Sunlight boys took the sponsors by bicycle to a local soccer field, where the soccer skills of the boys and the sponsors (or lack of skills) were on display. Fun it was. The delegation also visited Pnohm Penh, Cambodia. The Julia Kids Foundation had been asked to consider sponsoring an orphanage which operates a farm outside of PP. The kids are lovely, but the governing structure and the intentions of their board did not become clear to us. The farm is losing money, but their board did not seem open to our ideas. We just could not get a real clear picture of what was going on and decided not to participate. Our efforts and focus is better spent elsewhere. In october a delegation of the province of Flevoland in the Netherlands visited Vietnam to establish commercial and research ties with Vietnam. The delegation particpated in a conference on sustainable development. The delegation was also invited to visit Sunlight House and Thien Phuoc House. The consul of the Netherlands, mr. Simon van den Burg, joined the visit. One of the projects is to introduce Bitter Gourd (Bitter Melon) to European consumers beacause of its health improving elements. Julia Kids Foundation is interested, as a bitter gourd farm may provide a platform for a new kids house. A joint project involving the University of Wageningen (NL), the Agrarian Institute of Dronten (NL), the Nom Lam University of Saigon, as well as a number of companies has been initiated to investigate the possibilities. Oktober 2015 heeft een delegatie sponsoren Sunlight en Thien Phuoc house bezocht in HCMC. Het was zoals altijd indrukwekkend, hart verwarmend, leuk, interessant en tevens a good time. Onder de sponsoren bevonden zich enkele medisch specialisten. Die waren onder de indruk van de verzorging en conditie van de kinderen. En ook van de dossiervoering! Goed om te weten en te horen. 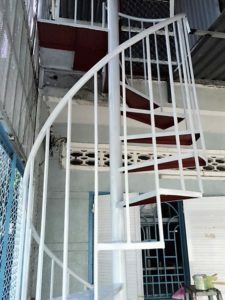 The stairs to the rooftop at Sunlight had rusted. It is a damp tropical climate. 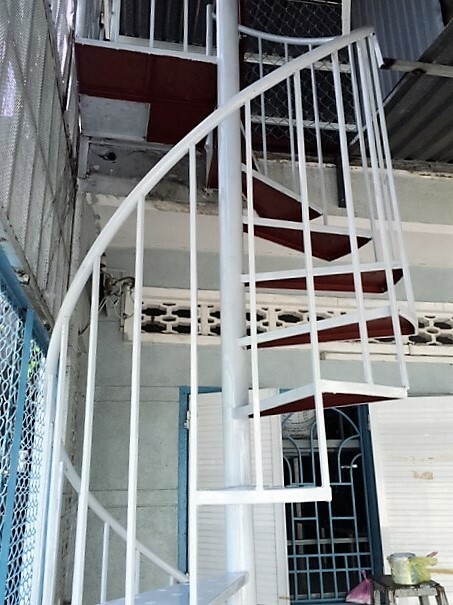 Financed by the Julia Kids Foundation a new stairway has been installed. . Looks good! 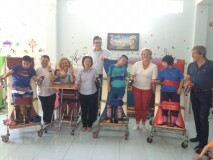 Januari 16-20 bezoekt een delegatie van JuliaKidsFoundation wederom Sunlight House in Ho Chi Minh City (Saigon). U bent van harte welkom om mee te gaan. January 16-20 a delegation from JuliaKidsFoundation will visit Sunlight House in Ho Chi Minh City (Saigon). Please join. 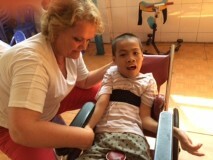 Enkele sponsoren van Stichting Julia Kids vliegen op 31-10 naar Vietnam om het Sunlight House te bezoeken. Interesse om mee te gaan? mail ons!